Myriapoda is a subphylum of terrestrial arthropods, characterized by an elongated body with many segments, typically many legs, a single pair of antennae, and simple eyes. The name myriapoda suggests these invertebrates have myriad (10,000) legs, but they range from less than ten legs to up to 750 legs. Prominent members include the centipedes, comprising the class Chilopoda, and millipedes, comprising the class Diplopoda. Two other extant classes are Pauropoda and Symphyla. Millipedes differ from the other groups in having their body segments fused into pairs, giving the appearance that each segment bears two pairs of legs, while the other three groups have a single pair of legs on each body segment. There are about 12,000 known species of myriapods. Myriapods provide important and diverse ecological functions, with centipedes primarily fast-moving and predatory, feeding on insects and other invertebrates, and even small vertebrates, while millipedes are primarily slow moving and detrivory, feeding on things like leaf litter and other decaying or dead plant matter. Myriapods provide an important source of food for many invertebrates and vertebrates. 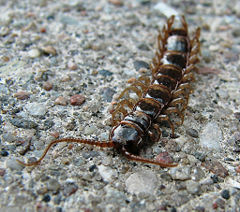 In addition, millipedes help in the recycling of nutrients, and centipedes aid people by consuming various household pests, such as bedbugs, termites, and cockroaches. Myriapoda is a very old group, with definitive fossils from the Late Silurian and centipedes from the Devonian, but myriapod-like forms from even the Cambrian. One ancient myriapod, placed in the class Arthropleuridea of extinct forms, was two to three meters in length, dwarfing the present-day small myriapods. As arthropods, myriapods have a segmented body, paired, jointed appendages on most segments, and are covered by a hard exoskeleton, made out of protein and a tough polysaccharide called chitin. This exoskeleton must periodically be shed when the myriapod grows and molts. There are estimated to be over 12,000 described extant species worldwide in Myriapoda (Chapman 2005), all of which are terrestrial (Waggoner 1996). Undescribed species may push the actual number of myriapods to over 85,000 (Chapman 2005). Myriapods are characterized by one pair of antennae, a single pair of mandibles, primitive eyes (ocelli), and many segments, which are not fused together. Their appendages have only one ramus, or branch (Waggoner 1996). Extant myriapods range in size from nearly microscopic to 30 centimeters in length, but an extinct form from the Carboniferous, placed in the extinct class Arthropleurida, was giant in size, reaching up to three meters in length. Myriapods range from having over 750 legs (Illacme plenipes) (Marek and Bond 2006; BBC 2006), the world's leggiest animal, to having fewer than ten legs (Waggoner 1996). Growth is by adding segments and legs with successive molts (anamorphic), and myriapods continue to add additional segments and legs after they have reached sexual maturity (BBC 2006; Paleos). Although not generally considered dangerous to humans, many myriapods produce noxious secretions (often containing benzoquinones) which can cause temporary blistering and discoloration of the skin (Arment). The majority of myriapods are herbivorous, with the notable exception of the over 2,500 species of centipedes (Myers 2001a), which are chiefly nocturnal predators. Pauropodans and symphylans are small, sometimes microscopic animals that resemble centipedes superficially and live in soils. Myriapods are abundant in moist forests, where they fulfill an important role in breaking down decaying plant material (Waggoner 1996), although some live in grasslands, semi-arid habitats, or even deserts, as well as human dwellings. The fossil record of myriapods reaches back into the late Silurian, although molecular evidence suggests a diversification in the Cambrian Period (Friedrich and Tautz 2002), and Cambrian fossils exist which resemble myriapods (Waggoner 1996). Centipedes fossils have been found from the Devonian (Waggoner 1996). There has been much debate as to which arthropod group is most closely related to the Myriapoda. Under the Mandibulata hypothesis, Myriapoda is the sister taxon to Pancrustacea, a group comprising the Crustacea and Hexapoda. Under the Atelocerata hypothesis, Hexapoda is the closest, whereas under the Paradoxopoda hypothesis, Chelicerata is the closest. This last hypothesis, although supported by few, if any, morphological characters, is supported by a number of molecular studies (Hassanin 2006). There are four classes of extant myriapods, Chilopoda (centipedes), Diplopoda, Pauropoda, and Symphyla. While each of these groups of myriapods is believed to be monophyletic, relationships among them are less certain (Regiera et al. 2005). There also is an extinct class of myriapods, Arthropleuridea. Members of the class Chilopoda are known as centipedes. They are characterized by long, flattened bodies with many segments, and with one pair of jointed appendages on each segment except the last two. The appendages on the first segment take on the form of jaw-like, venomous claws with poison glands that are used in capturing prey. The most anterior trunk segment of a centipede has a pair of venomous claws, called maxillipeds, that are used for both defense and for capturing and paralyzing prey. There are over 2,500 known species of centipedes (Myers 2001a), with some estimates as high as 5,000 described species (Chapman 2005), and Chapman (2005) accepting a figure of 3,300. Like the millipedes, which they resemble, centipedes are highly segmented (15 to 173 segments). However, millipedes have a cylindrical body with two pairs of legs on most segments (really two fused segments or double somites), while centipedes are dorso-ventrally flattened and have only one pair of legs on most segments (excepting the hindmost segment). Members of the class Diplopoda are known as millipedes. Millipedes have a long body with many legs and many segments (20 to 100 segments), like the similarly appearing centipedes. In the millipede, the anterior thoracic segments have at most one pair of legs—the first segment behind the head lacks any appendages, while the next few have only one pair of legs—but all the following abdominal segments have two pairs of legs. The millipede segments that have two pairs of legs are a result of fusion of each pair of body segments into a single unit, giving the appearance of having two pairs of legs per segment. Unlike the dorso-ventrally flattened body of the centipedes, millipedes have a cylindrical body. There are about 8,000 known extant species of millipedes, which may represent less than a tenth of the true global millipede diversity (Chapman 2005). Most millipedes are slower than centipedes, and unlike the predatory centipedes, millipedes are detritivores, with most millipedes feeding on leaf litter and other dead and decaying plant matter. One species of millipede, Illacme plenipes has the greatest number of legs of any animal, with 750 (Marek and Bond 2006). About 200 species of symphylans are known worldwide (Chapman 2005). They resemble centipedes but are smaller and translucent. Many spend their lives as soil infauna, but some live arboreally. Juveniles have six pairs of legs, but, over a lifetime of several years, add an additional pair at each molt so that the adult instar has 12 pairs of legs (OSU). Pauropoda is another small group of small myriapods. They are typically 0.5 to 2.0 millimeters (0.2-0.8 inches) long and live in the soil on all continents except Antarctica (ALR 2009; Chapman 2005). Over 700 species have been described (Chapman 2005). They are believed to be the sister group to millipedes, and have the dorsal tergites fused across pairs of segments, similar to the more complete fusion of segments seen in millipedes (Kendall 2005). Arthropleurids were ancient myriapods that are now extinct. The most famous members are from the genus Arthropleura, which was a giant, probably herbivorous, animal that could be up to 3 meters (about ten feet) long. The Arthropleurids may be a division of the millipedes. Animal Life Resource (ALR). n.d. Pauropods: Pauropoda. Insects and Spiders Scientific Reference. Retrieved January 14, 2009. Arment, C. n.d. Strange and unusual millipedes. Herper.com. Retrieved January 14, 2009. Chapman, A. D. 2005. Numbers of Living Species in Australia and the World. Department of the Environment and Heritage. ISBN 0642568502. Retrieved January 14, 2009. Friedrich, M., and D. Tautz. 2002. Ribosomal DNA phylogeny of the major extant arthropod classes and the evolution of myriapods. Nature 376: 165–167. Retrieved January 14, 2009. Hassanin, A. 2006. Phylogeny of Arthropoda inferred from mitochondrial sequences: Strategies for limiting the misleading effects of multiple changes in pattern and rates of substitution. Molecular Phylogenetics and Evolution 38: 100–116. Retrieved January 14, 2009. Integrated Taxonomic Information System (ITIS). 1999. Myriapoda ITIS Taxonomic Serial No. : 563885. Retrieved January 14, 2009. Kendall, D. 2005. Pauropods and symphylids. Kendall Bioresearch. Retrieved January 14, 2009. Marek, P. E., and J. E. Bond. 2006. Biodiversity hotspots: Rediscovery of the world's leggiest animal. Nature 441: 707. Retrieved January 14, 2009. Myers, P. 2001a. Chilopoda. Animal Diversity Web. Retrieved January 14, 2009. Myers, P. 2001b. Diplopoda. Animal Diversity Web. Retrieved January 14, 2009. Myers, P., R. Espinosa, C. S. Parr, T. Jones, G. S. Hammond, and T. A. Dewey. 2008. Myriapoda. Animal Diversity Web. Retrieved January 13, 2009. Oregon State University (OSU). n.d. Garden symphylans. Integrated Pest Management on Peppermint-IPMP3.0. Retrieved January 14, 2009. Palaeos. n.d. Myriapoda. Palaeos. Retrieved January 14, 2009. Regiera, J. C., H. M. Wilson, and J. W. Shultz. 2005. Phylogenetic analysis of Myriapoda using three nuclear protein-coding genes. Molecular Phylogenetics and Evolution 34: 147–158. Retrieved January 14, 2009. Waggoner, B. 1996. Introduction to the Myriapoda. University of California Museum of Paleontology. This page was last modified on 2 November 2018, at 19:36.